Noor Zaman won Gold medal. M. Ammad won Bronze medal. 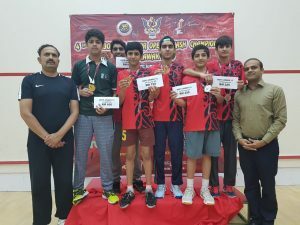 Khushal Riaz won Bronze medal. Hammad Khan won Bronze medal. It is pertinent to mention that beside Pakistan teams from Malaysia, Australia, Belgium, Singapur,India,Hong Kong and China participated in the tournament. All players are proceeding tomorrow for Penang Junior Open (26 June – 01 July) at Malaysia and will compete in their respective age categories.